“There was a consensus on taking effective measures to substantially reduce the United States trade deficit in goods with China,” read a portion of the release. Trade negotiations between U.S. and Chinese officials on Thursday and Friday of the past week in Washington, DC were a continuation of talks they began two weeks ago in Beijing. The talks this week, however, included fewer of the U.S. officials. Treasury Sec. Steve Mnuchin again led the talks that included Commerce Secretary Wilbur Ross and U.S. Trade Representative Robert Lighthizer, according to the release. The Beijing-based talks had also included Assistant to the President for Economic Policy Larry Kudlow, and Assistant to the President for Trade and Manufacturing Policy Peter Navarro. Chinese Vice Premier Liu He led the Special Envoy of President Xi in D.C.
Trump has repeatedly lamented the massive U.S. trade deficit with China. In early March he imposed tariffs on almost all imports of steel and aluminum to the U.S., addressing China’s steel dumping practices and the threat to U.S. national security. In early April Trump put it to U.S. Trade Representative Robert Lighthizer to look in to the possibility of imposing $50 billion in tariffs on Chinese imports to the U.S. The Chinese had fired back with threats of equal tariffs on U.S. exports to China which were met with increased warnings of up to $150 billion in U.S. tariffs on Chinese imports. 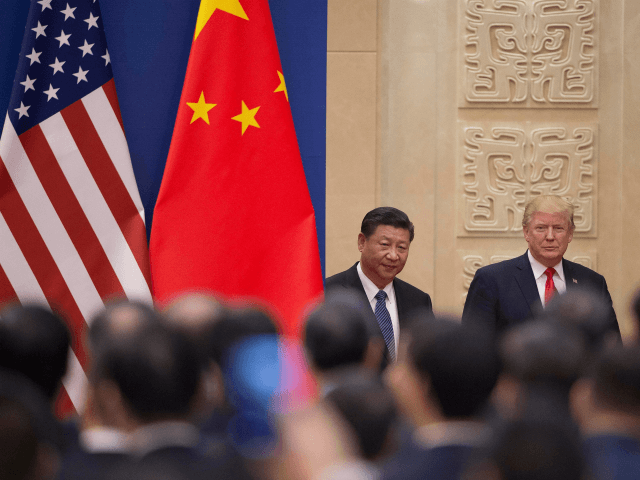 President Xi showed signs of relenting, but the White House was clear that they would need to see “concrete actions from China” before relenting on potential tariffs. Then in early May came the U.S. trade delegation’s journey to China for trade negotiations. Sec. Mnuchin led the delegation that included Sec. Ross, Trade Representative Lighthizer, Assistant to the President for Economic Policy Larry Kudlow, and Assistant to the President for Trade and Manufacturing Policy Peter Navarro. Kudlow later told Breitbart News radio listeners that the delegation did not expect a trade deal by the end of the Beijing-based talks and that he expected the process to be a “lengthy” one. It was not clear in Saturday’s White House statement when a delegation would return to China for the continued talks on reducing the U.S. trade deficit with China.